Inspired by the same Canadian flavours, this grain-free pâté is the perfect pairing to our SubZero Northern Lakes dry food. Combining canned food & kibbles increases palatability, helps keep pets hydrated and is an easy way to introduce variety in your pets everyday diet. Duck, duck broth, trout, lamb, salmon, herring, cod, peas, red lentils, canola oil, chickpeas, sweet potatoes, freeze dried duck, freeze dried salmon, salt, choline chloride, fresh whole eggs, cassia gum, carrageenan gum, sun-cured alfalfa meal, salmon oil, herring oil, coconut oil, DL-methionine, L-lysine, yeast extract, chicory root extract, yucca schidigera extract, rosemary extract, butternut squash, carrots, spinach, broccoli, apples, blueberries, cranberries, pomegranate, juniper berry extract, ginger, fennel, chamomile, peppermint leaf, licorice root, turmeric, valerian root, pea fiber, zinc proteinate, vitamin E supplement , L-ascorbyl-2-polyphosphate (source of Vitamin C), ferrous sulfate, zinc sulfate, iron proteinate, copper proteinate, thiamine mononitrate, sodium selenite, niacin supplement, pantothenate calcium, vitamin A supplement, manganese sulfate, riboflavin supplement, manganese proteinate, vitamin D3 supplement, vitamin B12, pyridoxine hydrochloride, calcium iodate, folic acid. 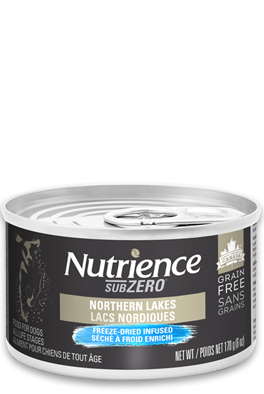 Nutrience SubZero Northern Lakes Pâté dog food is formulated to meet the nutritional levels established by the AAFCO Dog Food Nutrient Profiles for growth and maintenance, except for growth of large size dogs (70 lbs or more as an adult). Feed according to age, activity, environment and breed of your dog. Feed adult dogs 1 1/2 cans per 15 lbs of body weight per day. Feed puppies up to twice the adult amount. Feed at room temperature and refrigerate unused portion. Always provide access to clean fresh water. Review:Please write at least 50 words.